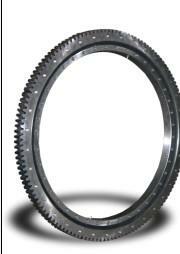 1167/560 UWE slewing bearing/slewing ring is a kind of special structure large bearing including rotating, transmission, fixed and other functions, and it can under high axial load, radial load and overturning moment load at the same time. Under normal circumstances, the slewing bearing itself both with teeth, mounting holes, lubricants holes and sealing devices to meet the requirement of variety of working conditions; on the othe hand, slewing bearing has a characteristic of compact structure, easy to guide rotating, convenient installation and easy to maintain, widely used in lifting and transport machinery, mining machines, construction machinery, port machinery, wind power generation, medical equipment, radar, missile launchers and other large rotary devices. 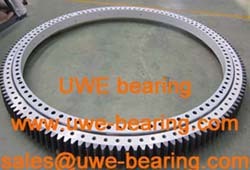 UWE slewing bearing includes four point contact ball slewing bearing, double-row different diameter ball slewing bearing, cross roller slewing bearing, ball roller combined slewing bearing, triple-row roller slewing bearing. UWE slewing bearings are widely applied to wind turbines, yaw, pitch system, container crane, tower crane, port crane, grab crane, ship crane, metal crane ,ladle turret, excavator, dredge, shield machine, grams make, metallurgical cranes, ladle turret, excavators, dredgers, shield machine, loading and unloading ships, stacker reclaimed, filling machines, CT machine, standing wave treatment instrument, tank and other military equipments. UWE bearing has more than 40 sets CNC metal-cutting, equipped with complete heat treatment equipment and detection equipment, processing capacity and technical strength in the forefront of the similar enterprises in the country. 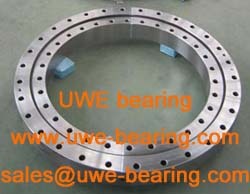 How can you buy 1167/560 UWE Slewing Bearing/slewing Ring on the Internet? 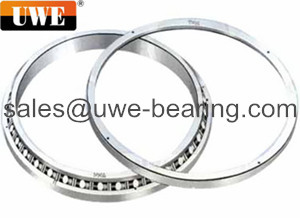 High quality 1167/560 UWE Slewing Bearing/slewing Ring, Just click the button " Contact Now " to mention your purchase Requirement , Quantity and Contact Method of your requested Bearing Item No. 1167/560. then click the button " Send " The web site will make your purchasing information sent to the supplier's mailbox, who will come to contact you upon they get your information at the first time.